Some years back when we was driving through Oxfordshire, heading to visit friends in Reading, I glimpsed a building with this incongruous combination of a tall industrial chimney on an English county house. At the time I fantasised it was built by one of the magnates of the industrial revolution, with the chimney a symbol of its roots. 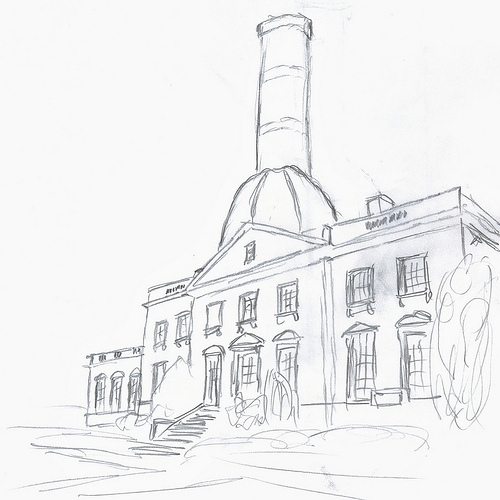 This is what I imagined it would like close-up — looking at my drawing, I think the chimney should be even taller! I’ve always been intrigued to find out more about this building and where it is. It turns out that my English country house is actually Bliss Mill near Chipping Norton in Oxfordshire. I hadn’t appreciated just how much the chimney was modelled on a bathroom plunger! 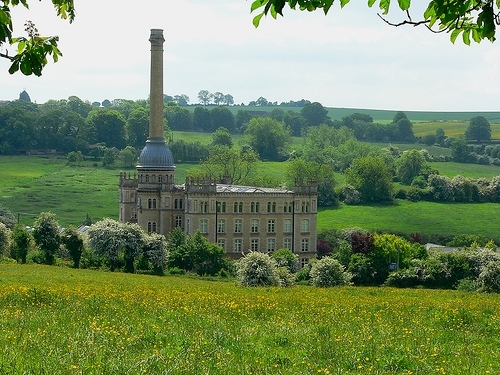 “It’s Bliss Mill, near Chipping Norton in Oxfordshire. One of these bizarre industrial revolution vanities where someone build a factory to look like a stately home.